Whether it’s for business cards or bio data cards, South Asians are drawn to South Asian professional organizations. On the east coast, one of the major networks is NETIP, or Network of Indian Professionals, which has a national membership, along with a yearly conference that draws thousands of South Asian Americans from all over the country. Workshop topics include: Blending Our Identities and ABCDating.Â Though many might come for professional development, many do leave with what regulars call a “NETIP hook up”. On the west coast, there is not one predominant organization, but rather smaller networking groups that hold monthly mixers and also collaborate with each other. In San Francisco, SAPA, or South Asian Professionals Association, is one group that has kept a consistent presence among the Bay area community. Pooja Jain, co-founder of SAPA, has experienced the benefits of culturally focused networking first hand. “We have received generally positive feedback from members…ranging from folks building key business contacts, learning about other non-profits who partner with us, to making new acquaintances and building lasting friendships. Many professionals come by and unwind with a drink, and the best feedback we receive is that people keep coming back,” Jain shares. Whether you just like hanging out with your culture, hooking up with your culture, or both, the bottom line is that South Asian networking events are the place to be.Â The vibe is meeting new people and the platform is usually alcohol, so even the most timid of networkers is sure to walk away with a few business or bio data cards. 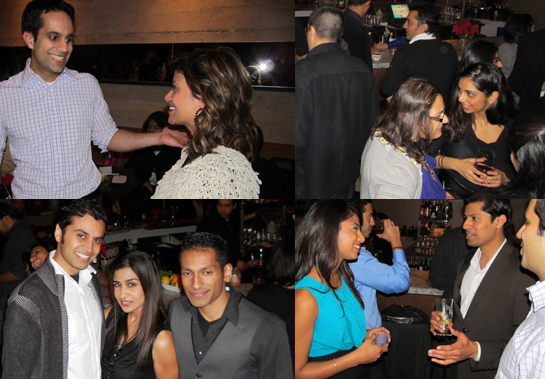 What’s your take on the South Asian American networking scene?